The tabloids loathe them, but anarchists are too busy arguing with each other to riot. Anarchism is often associated with chaos and makes newspaper headlines whenever there's been a riot on the British mainland. The Anarchy In the UK festival, on all this week across London, demonstrates that the vast majority of anarchists aren't interested in throwing bricks and bottles at the police. While anarchism as a political doctrine has never exerted much influence outside Spain and the Ukraine, the impact of anarchist ideas on the arts has been enormous. Bohemianism is a quintessentially anarchist pursuit and it is this, principally in its subcultural guises, that forms the focus for the ten day Anarchy In The UK festival. The event is the brainchild of Ian Bone, a founder member of Class War, whose past activities do little to inspire trust among old hands at anarchist politics. At one point, Bone left the Class War Federation to set up the rival Class War Organisation, which collapsed after a single issue of its national newspaper. Among revolutionary anarchists, Anarchy In The UK is derisively referred to as the Bone Show. While the festival will thrill all rebellious punk squatters, the major British anarchist groups are refusing to participate in what they perceive as a desperate attempt to revive the careers of some second-rate rock bands. An obsession with autonomy, or freedom, is what characterises all anarchist thought. Naturally, this leads to a great deal of sectarianism. One of the major divisions within anarchist thinking is between collectivist and individualist ideologies. While anarcho-individualists have never attempted to build mass political organisations, their collectivist brethren find that although there is a great deal of support for anarchist ideas, very few people are willing to become paid up members of the movement. Indeed, no British anarchist group has an active membership of more than a hundred individuals. When the tabloid press report that Class War are responsible for the riots that have broken out during recent demonstrations, this is patently absurd. Street violence of this type is the result of the utter frustration many people feel at the huge increase in poverty that has accompanied the dismantling of the welfare state. Class War are not in a position to organise riots, almost all their time and energy is put into producing and selling their newspaper. Most of the Class War groups around the country consist of one or two individuals with a post box address and a can of spray paint. While a percentage of the people participating in riots may have become sympathetic towards anarchist ideas after experiencing unemployment and heavy handed policing, very few of them are members of any political organisation. 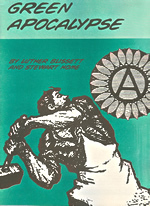 Easily the most active strand of British anarchism throughout the eighties was that of pacifism and non-violence. Many anarchists who are happy to glue the locks of butchers and participate in animal rights campaigns, wouldn't dream of taking part in a riot. Likewise, anarcho-individualists and anarcho-capitalists are generally contemptuous of demonstrations and acts of public disorder. Many of the younger and more committed class struggle anarchists who do view rioting as a viable political tactic, quickly leave the movement. They often find themselves unable to resist the lure of left-communist splinter groups. In attacking democracy as a bourgeois distraction, organisations such as the International Communist Current provide an ideology which is much more coherent than that of the anarchist movement. One of the attractions of anarchism is that it can be practised as life-style that doesn't require a great deal of commitment. Bohemian types may voice support for Class War, but they are unlikely to join the group because that would entail standing on street corners selling political literature and attending boring meetings. Likewise, squatters may find the doctrine of anarcho-syndicalism appealing, without actually wanting to go into some industrial work place to participate in rank and file activism. Class War began as a witty attack on both the left and anarcho-pacifism. Today it is a poor man's SWP, as obsessed as the next revolutionary splinter group with selling the paper and building the party. In a mirror image of this process, Ian Bone has reverted to the type of anarchism that was once reviled in the pages of Class War. CND, pacifists and scruffy punks used to be the subject of Bone's invective, now he is actively promoting their interests with the Anarchy In The UK festival. This includes concerts by the Levellers and Conflict, alongside workshops on such stimulating topics as Love and Liberating Our Meetings. For full details phone the festival hotline on 071 274 6655. These are the main anarchist organisations in Britain. CLASS WAR FEDERATION, PO Box HH57, Leeds LS8 5XG. Aims: To increase the militancy of working class peoples’ attempts to solve their own problems — through propaganda, active participation, and debate as equals. What they say about themselves: Violence is a necessary part of the class war - but as mass class violence, out in the open. Not elitist terrorist actions. What they really do: Recruit people who can’t take the rigorous discipline of the SWP. SOLIDARITY FEDERATION (until recently the Direct Action Movement), PO Box 384, Preston, Lancs PR1 5PQ. Aims: To promote workers’ self-management and revolutionary unions as the way to overthrow capitalism and establish libertarian communist society. What they say about themselves: Our aim is the creation of a free and classless society. What they really do: Seek to recruit trade unionists, and according to sectarian myth, they become sexually aroused when watching Come Dancing. ANARCHIST COMMUNIST FEDERATION, 84b Whitechapel High Street, London E1 7QX. Aims: Put the class into class politics. What they say about themselves: We reject sectarianism and work for a united revolutionary anarchist movement. What they really do: Fail to work co-operatively with any other anarchist group. GREEN ANARCHIST NETWORK, Box ZZ, 111 Magdalen Road, Oxford, OX4 1RQ. Aims: Autonomous self-sufficient villages, bringing regression of technology, no industry, no pollution, no hunger, no bomb. What they say about themselves: We must build a culture of resistance from festivals, gigs, fanzines, for a future alternative society. What they really do: Circulate texts denouncing their founder and ideological architect Richard Hunt, who has caused them deep embarrassment by defending former National Front leader Patrick Harrington from accusations of fascism. LIBERTARIAN ALLIANCE, 1 Russell Chambers, The Piazza, Covent Garden, London WC2E 8AA. Aims: Life, liberty and property. What they say about themselves: The Libertarian Alliance exists to promote the broad range of libertarian, classical liberal and free market ideas. What they really do: Provide bored right-wing students with a sense of getting involved in something dangerous, most obviously because they favour the decriminalisation of hard drugs. ANIMAL LIBERATION FRONT, no public address. Aims: End the exploitation of animals. What they say about themselves: A lot of people would like to get involved in the ALF but are afraid to do so, don’t be, it is essential that you do for the sake of the people who have been and will go to prison but also obviously for the animals. What they really do: Dress up in ski-masks and take snap shots of each other holding rabbits and other furry animals. LONDON PSYCHOGEOGRAPHICAL ASSOCIATION, Box 15, 138 Kingsland High Street, London E8 2NS. Aims: To smash the occult establishment, end masonic mind control, and expose the involvement of the royal family in acts of ritual king slaughter. What they say about themselves: After thirty-five years of non-existence, the London Psychogeographical Association is well and truly back. The revival of the LPA corresponds to the increasing decay in British culture, and indeed of the British ruling elite. It has been, in fact, an historical inevitability. What they really do: Organise games of three sided football on triangular pitches with three goals, keeping a careful tally of the goals each team concedes. A version of this text, edited to fit the newspaper's style appeared in the Independent during the Anarchy in the UK festival in 1994. This article was written for The Independent and was subsequently reproduced in the documents section of "The Green Apocalypse".